On Thursday morning, Melania Trump traveled to Texas to visit detained migrant children and their caregivers at the Upbring New Hope Children’s Center. 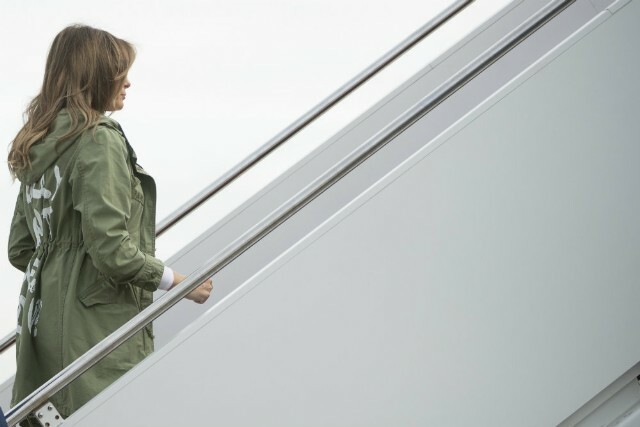 The first lady’s attempt at providing damage control to the humanitarian crisis wrought by her husband’s hardline immigration policies was undercut by the wording emblazoned on the back of the green utility Zara jacket she wore while boarding Air Force One. She didn’t appear to be wearing the jacket when she arrived in Texas. As the Daily Mail first reported, the back of the jacker reads “I Really Don’t Care, Do U?” Although the available Associated Press images don’t provide a clear shot of the back of the jacket, CNN reporter Kate Bennett confirmed the Daily Mail’s report. According to a statement from the first lady’s spokesperson Stephanie Grisham, there’s “no hidden message” behind Trump’s wardrobe choice. The “important visit to Texas” entailed a photo op at the children’s center after the president made a grand show of signing an unnecessary executive order to end his own administration’s policy of taking migrant children and babies away from their parents and tossing them into internment camps as part of President Trump’s “zero tolerance” immigration stance. Over 2,300 children have been taken away from their parents at the Southern border since mid-May and placed into facilities. Here’s footage of Trump sort of engaging with a caregiver regarding treatment of the children. Although it’s unlikely that Trump was sending a deliberate message with her wardrobe choice, the optics are still terrible, especially after weeks of the president passing the buck to Democrats to pass legislation ending his own policy. You could argue that Trump really tipped her hand when she wished the foster children “good luck” upon exiting the facility. They’re gonna need it considering the White House doesn’t seem to have any mechanism in place for reuniting the children with their estranged families.